[New Delhi] Govt Has Adequate Cash But ATMs Are Dry,FM Tweets Early Cure . Finance Minister Arun Jaitley today said there is “more than adequate” currency in circulation and the temporary shortage in certain states is being “tackled quickly”. 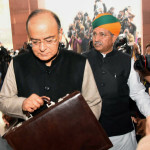 Jaitley said in a tweet that he has reviewed the currency situation in the country. Minister of State for Finance Shiv Pratap Shukla said the government has formed a committee to address the problem of currency shortage in certain states and the issue would be resolved in next 2-3 days.